Dubai: Residents and visitors in Dubai will get to enjoy another dancing fountain and this time, it will be at the Palm Jumeirah Islands. The soon-to-be attraction will be the centrepoint of The Pointe, a retail and entertainment destination that is home to Nakheel’s seafront dining and shopping venues. The UAE-based developer announced on Sunday that it has just signed a Dh66 million deal to set up the choreographed water spectacle that is envisioned to cover a 12,000 square-metre area of water at the tip of the Palm, across the bay from Atlantis hotel. "Today’s signing is a major milestone for The Pointe, as it means work on its centrepiece – the fountain – is now underway, and we are one step closer to delivering this eagerly-anticipated destination," Nakheel chairman, Ali Rashid Lootah said. Choreographed fountains are a major draw to tourists. Emaar’s Dubai Fountain at Downtown Burj Khalifa, dubbed as the tallest performing fountain in the world, attracts thousands of visitors every day. The fountain is set on the 30-acre lake just outside Dubai Mall and is at more than 900 feet in length, which is equivalent to more than two football pitches. 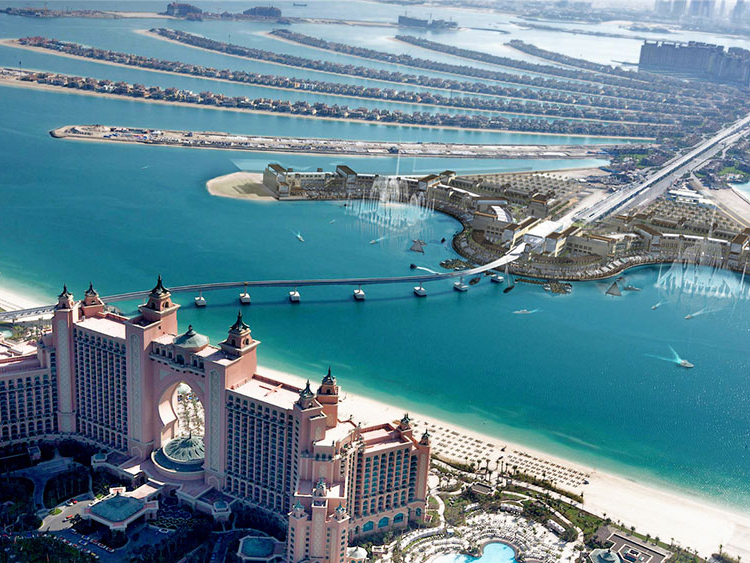 In an announcement, Nakheel said it is commissioning Chinese specialists, Beijing Water Design, to install and operate a similar fountain system at the Palm. The Pointe is currently being developed and is estimated to cost Dh800 million. It includes a 1.4 million-square-foot retail, dining and entertainment complex and a 1.5-kilometre promenade that will be home to seafront dining and retail outlets. Nakheel is also developing a shopping mall at the heart of the Palm islands. As of March 2018, the Dh1.2 billion retail venue was 85 per cent complete. It will be home to a 60,000-square-foot, 15-theatre Vox Cinemas complex.